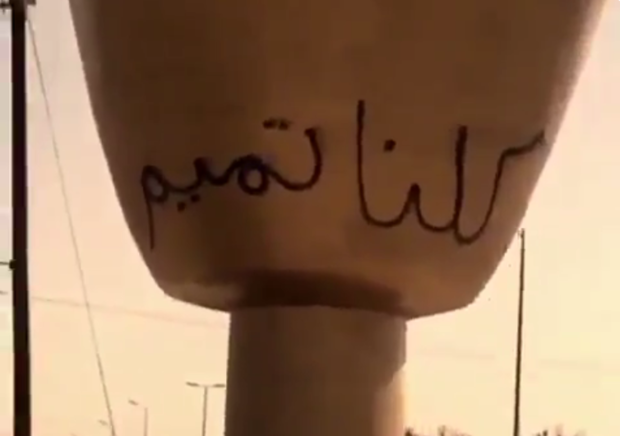 A video showing a Saudi monument in the Qassim region spread with graffiti expressing sympathy to Qatar has gone viral on social media at the time Riyadh has decreed prison and fine sentences for any message showing support for the tiny emirate isolated by the Saudi-led bloc. 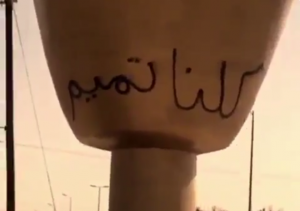 The graffiti, which appeared on a sculpture in the centre of a roundabout in Saudi Arabia, reads “We are all Tamim” and “Glory to Tamim” referring to Qatar’s emir, Sheikh Tamim bin Hamad al-Thani, Middle East Eye reports. Saudi Arabia has banned any expression of support to Qatar and imposed up to 15 years in prison and a fine of about $136,000 on offenders. Saudi Araboa, the United Arab Emirates, Bahrain and Egypt, followed by several allies, on June 5 severed ties with Qatar. The four have also imposed air, sea and land blockades on Doha. The bloc accuses the tiny gas-rich kingdom of sponsoring terrorism. A week ago, they tightened their grip after handing over to Doha a list of 13 demands to be fulfilled at the latest Sunday. Written by: KanelkaTagba on July 1, 2017. Posted by KanelkaTagba on Jul 1 2017. Filed under Gulf News, Headlines. You can follow any responses to this entry through the RSS 2.0. Both comments and pings are currently closed.